Chatbots are the next big lead generation tool for marketers and businesses to boost their leads and sales. Over the last three years, users have been flocking to messaging apps for private conversations, and using downloaded apps less. Users spend more time messaging than they spend using apps. With users spending more time in private messaging conversations, are they lost to marketers? How can marketers and businesses reach these users? Enter chatbots for lead generation. Messaging apps boast 5 billion users worldwide. 5 billion! Users are accustomed to using chat tools to communicate with others, so engaging with a chatbot is a familiar platform and an easy transition to get information from brands who provide a fun way to showcase their product or service. Chatbot lead generation works for many reasons, and one of the biggest reasons is the increase in users who spend time on messaging and chat apps. Users are very comfortable with chat, and because of that familiarity, they are willing to continue a conversation with a chatbot. The longer the conversation, the more data is collected, and this data helps you segment your marketing campaigns and upsell users on recommended products and services based on their preferences. Studies show that users are often more comfortable talking to a chatbot than a live chat application. This may be because they don’t like the social pressure of talking to a real person who may hard sell them. The most important questions for chatbot lead generation include product preferences, product reviews, and location-based offers based on city, state or zip code. The chatbot’s goal is to anticipate what the user is going to ask and to provide a response that is fun, engaging and informational. It is critical that chatbots engage in an easy conversation because this is another factor for lead nurturing. The conversational way in which the bot talks will make it easier to extract the prospect’s contact information and qualifying information by asking at the right time. The rest of the lead generation is similar to a form where the collected information is sent to the CRM as a lead. When creating a lead generation chatbot, keep the following items in mind. Have a fallback if the person wants to talk to a live person or contact someone immediately. Ask qualifying questions to help prioritize the leads. Make sure the users know it is a chat bot not a live chat. Connect the contact information to the exact page the prospect was on when they engaged the chat bot, and include other conversational threads. Engage the prospect in a conversational way and be polite. Don’t trick them into giving their contact info, which only creates low quality leads. 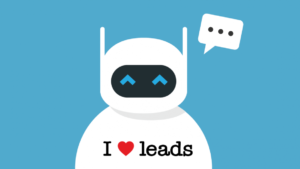 Need help building a lead gen chatbot? Our chatbot consulting team is ready to help. Click here for more info.